There is a wonderful group of creative artists who can be found on Google Plus, who have been participating in a scavenger hunt for years now. The hunt was originally led by Chrysta Rae. When I began participating in the hunt, Chrysta was still organizing, with the help of many creative individuals the photography scavenger hunt. For the past three hunts, the amazing Lauri Novak has been the one leading all of the scavengers, again with many wonderful helpers. Here is how it all works. There is a sign-up period. All photographers who are interested in participating indicate that they are in on the sign-up post. A specified number of photographers get to participate. The number has ranged from 300 to 500 photographers for the hunts that I have participated. I believe my first hunt was hunt 16. We have just finished hunt 22. As soon as all of the participants are set, a list of words is given. For the last hunt, the list of words was: ends, fate, nuts, panning, pastel, sizzle, and vintage. A time period is set. All participants work throughout the given time period to create an image for each of the words or for as many words as they can. At the deadline, images are submitted for judging by a panel of judges, the Dream Team (wonderful helpers who help Lauri make it all work), and by the participants themselves through a People’s Choice award. For this hunt, along with some regular photographs, I decided to submit two composites. This was my submission for pastel. I was honored to receive a third place recognition by the Dream Team for this image. 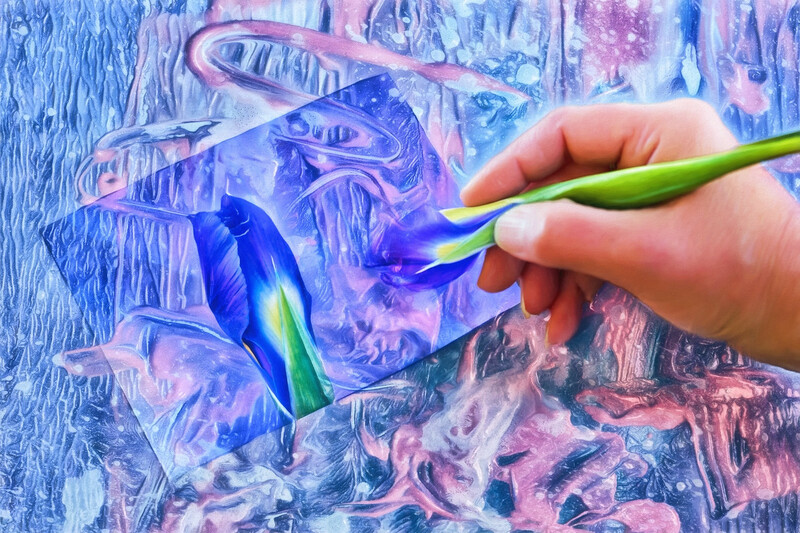 This image was created using a flower that looked like a paintbrush to me. Using layers to add the pastel paints just seemed to pull it all together. My submission for ends also was a composite. I thought the peacock from Magnolia Plantation and Gardens would make a perfect bookend. 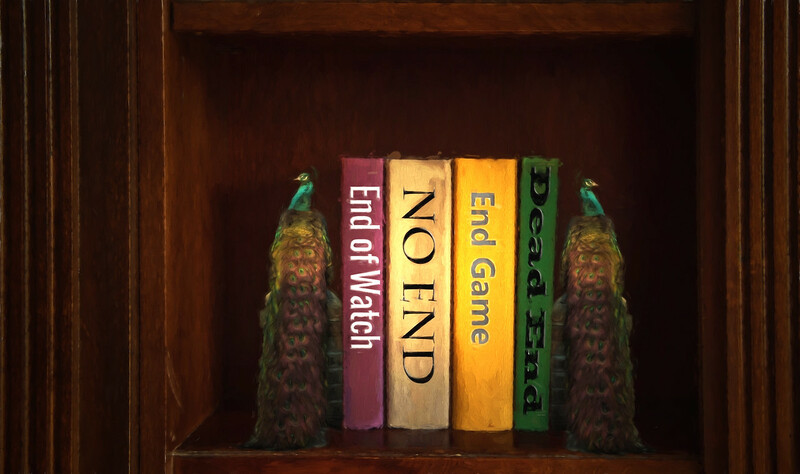 I found some books that had similar colors, added titles of books containing the word end, and had my submission. I was honored to receive a Second Place honor from the Dream Team for this image. What is so amazing about this scavenger hunt is that it takes photographers of all levels and pushes them to their personal best. There is such support and cheering from all involved along the way. I know that my participation in the past seven hunts has made me a better visual artist. It has also led me to get to know fabulous photographers from all over. This Saturday, the sign up for hunt 23 will be posted. You can see where to sign up here. I sure hope you will join us for the next exciting scavenger hunt! I look forward to seeing what you create! I have been able to learn so much about Photoshop as I create these composites. If you would like to learn more about postprocessing using Lightroom or Photoshop, I hope you will join Les Saucier and me at our postprocessing workshop planned for September. You can get information about this workshop here. Mary, I always look forward to see what you come up with next in Photoshop. Pastel image is great. Thank you, kindly, Dan! I do love Photoshop:)! Thank you, so much, Lauri! It has been such an honor to be a participant! The idea behind this one is just perfect. You have drawn me in by showing me that the flower does look exactly like a paint brush. This was my winner. Thank you, so much, for your very kind comment!